Mobstar is one of the biggest online mafia games in the web today (August 2008). It is played by thousand of peoples around the globe. You start in the world of Mobstar as a small crook. Your first choice is to select your starting location in the world. Then, there are four main categories of actions. These are crimes, investments, conflict and gambling. 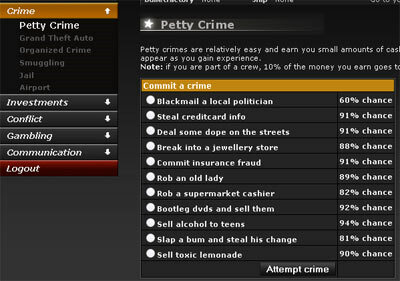 These categories try to cover many aspects of mafia crimes. Some examples are drug dealing, grand theft auto, stock market, casino games, attacks etc. Of course there is always the territory factor which always plays its role. You need to travel from one place to another by using the airport or your personal jet (if you have it). Or you will need to ship a stolen car to another country in order to reduce the risk of losing it. Territories are also a matter of control between crews, in which players unite with each other with common purposes. In general there are many features in the game and we would need a very big article to cover them all. For players that like to discover new features, mobstar will be ideal as even the experienced players will need some time to find out everything and become competitive in the game. One of the game highlights is the Texas Hold em Poker feature which can be a very interesting way to "kill" your time. The graphics of the game are shiny and nice to the eye. The game interface is enhanced with some mini icons and a map of each territory which help the game navigation while keeping the interface pretty. As for addictiveness, we might have not played the game for a very long time but it is obvious that it has to do with two factors. The first factor has to do with player type. If you like mafia games and have played other mafia games in the past, it is sure that you will like Mobstar a lot as its features can withstand the competition. The second factor has to do with the fact that many features of the game are locked to non-paying members. This means that people who do not want/cannot pay, will find Mobstar uninteresting. The aspect of time needed to play the game is similar to the majority of games in the web nowadays. The more time you play, the better for you in-game. As for the game difficulty, Mobstar comes with a nice tour new players can take and it is advisable that even experienced players give it a try. However as we said before the game features are quite many and the tour does not cover them all so you will need some extra days in order to learn the game. Our final verdict is that if you like mafia games, you must try it out.